Ever since Sage released their official SalesLogix community website & forums, I’ve wanted a better way to search and browse the forums. I’ve been working on a desktop client that does just this in a better, faster, and more efficient way. So, I’d like to announce the public release of Community Explorer. Community Explorer is a desktop application that will allow you to search the official Sage SalesLogix community forums and blogs in a much faster, precise, and effective way – letting you get to the information you need faster. It also allows you to simply browse the community forums in an easier way, similar to browsing a newsgroup or e-mail. The current version is beta, so expect to see releases with bug fixes. There are also more features planned for Community Explorer, including viewing recent posts & threads and even toast-like desktop notifications alerting you of new activity in the forums. 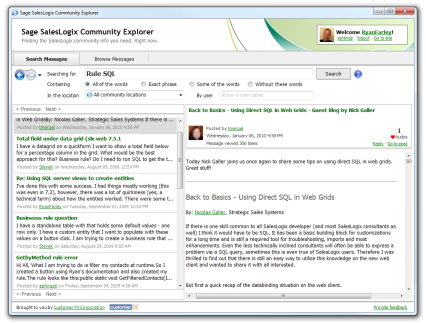 Take a look at the Community Explorer page and install it to give it a try. I would love to hear your feedback! Thanks Mike! There are some huge things on the horizon for this tool that will give you more of the warm fuzzies you got from the older newsgroups. This is just the start of things.